I see a page in a book with red and pink and yellow and light and dark green circles which all put together form a big circle. I also see the teacher's lap, his blue pants the wallpaper, and somewhere there I was interrupted before I was even halfway in describing what I saw. I'm not even sure if I started my description with the page in that book. I do rember that I found the whole exersize a strange and idiotic. Can't the teacher see for himself what's in that book? Why would I care what's in that book? It's probably some small childhood trauma that I saved such a picture in my pictures collection. After staring for nearly a minute, I'm fairly certain it says '73'. But it is very hard to see, and I'm not 100% certain. Maybe 70%. To my wife (the mythical tetrachromat) they are instantly and obviously different, notably in the tint of the foreground (bottom of the image), and background (top of the image), among other things. To me the background is identical no matter how long I stare at it, and the foreground is only very slightly redder in the 'normal' image than in the 'deuternopic' image, but it took a long time to identify. I remember when I was first administered that test. I was five years old. The nurse who administered it told me I wouldn't be able to do the two things I most wanted to be when I grew up: Electronics (because of all the different colours of wires) and fighter pilot. I have never given much importance to colors. I can see them, but never woried much about them. The two "mi casa" pictures are for me just some variation in lighting, I see the difference, but if I saw only one of the pictures a bit later I would not be able to tell if it was the left or the right one. To me it's just some difference of white balance between different kinds of lighting. Lighting, have you ever tried to play with that on purpose? If you shine a red light on a red and green object, the red part should increase more in brightness than the green part. Now Jim has a real point. I'm nearing 50 now and still don't need glasses, but my eyes are noticably getting more troubles with small details. A lot of bright light helps, I've got 150 Watts of FL lighting 60 cm above my desk and it still might be more. Sometimes thinging of buying a decent stereo microscope, but I do not dare. I'm afraid that an USD200 microscopes from ali are "not good enough" and USD 1200 for a good microscope is a bit much for me. Modern electonics stuff is reaching amazing levels. I can use a USD150 Phone as a quite decent magnifieng glass, but it's not stereo. But I guess that would be hard. If you don't have the color sensors to look with there is no substitute. I still have vague memories of our first color television. I did not like it, I was used to black and white and I think the B&W picture was sharper than the new color picture. I was more sort of amazed and comforted that the colors didn't mean much to me. I once planted my fist in an ACER LCD monitor. The colors/contrast of that thing was so bad that I was glad I had to buy a new monitor. You are correct that B&W is sharper, well it had more resolution. Not sure where you are and what TV standards you experienced. In the US we used to call NTSC Never Twice the Same Color. Color TV is a clever compromise, It has to fit in the same bandwidth (or did in the US.) The color is modulated on the B&W signal. In the US this is a 3.Iforget Meghertz carrier known as the color burst. The B&W TV signal is the Green curve. (Film on the other hand is sensitive to blue.) Ironically the blue phosphor was the hardest to replicate. They used to paint the sets in what look like weird colors. There was one palette for film and different one for TV. I was reading recently that the sets from the film Holiday Inn, were re-used for White Christmas. Which is why the colors are muted in the latter film as there was no time to repaint them. In black and white film they also would sometimes paint the shadows into the sets. In the modern color theory there are two axis that (Sorry Newton) describe a multidimensional non-linear solid. Blue/yellow and red/green. Yet we think we see three colors. The yellow green peak is the max of the curve. Red/blue is actually a harmonic opposite ends of the spectrum. The black/white points are another axis into this solid. What I learned is that color is predominately a representation of temperature. Supposedly Einstein said that "Time is the easiest to measure and hardest to define. Temperature is the hardest to measure and easiest to define." It is all a matter of perception. Culture and climate may (from statistical testing) also affect what we see. A lot of the color science foundations lie in the german chemical industries of the 1920s and 1930s. Some of the fundamental papers on the biology of color were fascinating reading, but gets into gray areas (pun intended) that can not be discussed without emotional response, which also can be described as color. I have read on the DoctorWho forums there has been some success in recovering the color of early TV episodes, where the masters were lost, from the so called chroma dots in the Black and white telerecordings. I seem to remember reading that the B&W TV systems were the same worldwide. Then came CBS color, which used rotating filters and three separate frames for Red,Green,blue. This was not compatible with the bulk of the viewers, so RCA/NBC lobbied to have it overturned in favor of the compromised color. When the UK (PAL) and Europe (SECAM) converted over, they did not keep the black and white compatibility. In the US one could turn the color adjustment knobs and make people purple. When Laser disk, then Videotape came out they used to have color calibration programs. (some of these were carried over to DVD, which did not work as well as the signals were digital reconstructions of the analogue patterns.) I still have a color bar generator that I built decades ago. You used to have a piece of blue film to look through to the color bars to adjust the steps. Interesting enough most people would turn the sharpness, to the setting that decreased the resolution. TV was supposed to be made up of dots. Now that everything is digital, this is more or less a footnote in history. As for the Stereo microscope. I got a rework station at a surplus store for cheap. I threw most of the unit behind, but kept the microscope and it's cantilever arm. I had to get some new eyepieces, which at the time was not difficult. Most of the course work I do is with something called optivisors. Then I have always been nearsighted with astigmatism, and have had to wear glasses most of my life. A few years back I got a cheap USB inspection microscope. I find it useful from time to time, although it is sensitive to the lighting. The mfg requires a signed NDA to get the dev kit and the signals for turning the ring light on and off. The USB video side on the other hand seems standard and can be accessed in most of the apps I have experimented with. My left and right eye don't see exactly the same colours, but this is only perceptible in very specific lighting conditions. The difference is very subtle, I noticed many years ago when I was a child looking at walls painted with certain colours. lol -- so >>you<< are the one looking at the world through rose-colored glasses. Or closer, you have built-in yellow "shooting" lenses. I'm guessing that my color vision is about normal. I don't know if the 73 is supposed to be easy or hard to see. What I know is that I have no concept of what you normal people see for binocular/stereo vision, as one of my eyes is 20/400. The nurse who administered it told me I wouldn't be able to do the two things I most wanted to be when I grew up: Electronics (because of all the different colours of wires) and fighter pilot. Chatting with the eye guy during an exam and being fitted for new prescription, the conversation topic turned to softball. chat--click click click--"What position do you play?" --click click--"Usually outfied." --click click--"Have you ever caught a fly ball?" If a ball hit directly at me I have no idea how far. A bit of an angle and then it is all experience. I don't know if the 73 is supposed to be easy or hard to see. We were seated in the cafeteria and the teacher moved past us with the book so fast, I couldn't have seen the 73 if it was printed in 144 point type black on white. I have pretty good color vision, and it's definitely harder than the "completely whited out 73", but easier than the just-greyscale version. I do need a few seconds to let the colors of the picture sink in and a few seconds to decipher. Is there a "partia" color blindness or is it more an on/off situation where you either do or do not have the right color sensors? And don't forget that on a PC monitor the colors are rusually not calibrated and different LCD technologies will influence the results. Even for us who are not daltonic, human visual pigments just aren't that good. We only have 3 and spectral coverage is not great. The damn birds can see UV and the peaks are more evenly distributed. We humans have the green and red pigment too close, maybe that's why it takes a while to make out the number even if you are not daltonic, probably the brain is working overtime to deconvolute the input signals. While that's somewhat true, the underlying mechanism behind virtually all forms of colour blindness associated with the retina (IIUC there are others which are associated with the visual cortex) is not greatly affected by any kind of colour calibration which can be performed on a display device. There are very nearly as many forms of colour vision (both 'normal' and 'deficient') as there are individuals in the species. It comes down to the trichromacy of human retinal cells, and genetic underpinnings of their spectral sensitivities. S, M, and L stand for short, medium, and long wavelengths. A given wavelength of light falling on an area containing cone cells will cause each cell to respond according to these curves. 450nm will cause the blue cone to fire strongly, while the green and red cells will fire weakly. The data point provided by the three responses from the three different cones is what allows us to differentiate one wavelength of light from another. It's quite complicated, and there are a number of neural layers between the retinal and the brain which provide various kinds of preprocessing (edge detection, movement detection, etc. 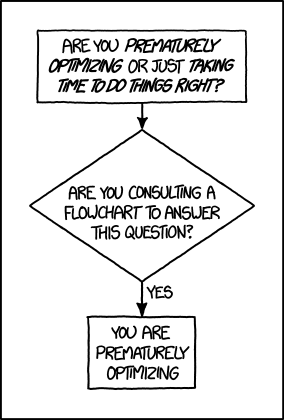 ), but that's the basic mechanism. Now the part that makes each of us different. Each type of cone has the spectral response it does due to the properties of a pigment contained within the cell. In turn, that pigment is encoded in a gene (or genes) in the individual's genome. 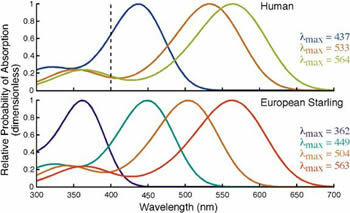 Variations in these genes (the general term is 'allele') result in pigments with different spectral properties, so that the above spectral curve illustration will look different for individuals who have different alleles for one or more of the three types of cone cells. In the case of anomalous tricromat individuals such as myself, they still have three types of cone cells with peak sensitivities at three different wavelengths, but the peak and spread of one of those curves differs from the norm. The most common type of anomalous tricromacy is deuteranomaly, where the green cone has a curve which is 'shifted' away from the norm. In my case, the green cone has a peak sensitivity nearer to that of the red cone. This makes it difficult to place the real wavelength of incident light on the spectrum, as the responses of two of the three cones are harder to differentiate from one another. While you, Paul, may suffer from deuteranomaly, it might be less pronounced than, say, mine, in that the peak sensitivity of the affected cone may not be shifted as far from the norm as for me. Or, if your affected cone is the red cone (protanomaly), and it is shifted towards the green, then your experience will be different than mine for that reason as well. Rarer forms of colour deficiency are dichromacy, where one of the types of cones is entirely absent (protoanopia for red, deuteranopia for green, and tritanopia for blue), making colour discrimination even more difficult. Even more rare are forms of total colour blindness, or monochracy. The eyes of the Mantis Shrimp are astonishing for a great many reasons, not the least of which is that it has somewhere between 12 and 16 different types of colour sensitive cells, most with a different spectral response. This doesn't translate to an enhanced ability to discrimiate between colours, however. Some interesting reading. The genes which encode the pigments for the red and green cones are found on the X chromosome. A consequence of this is that men are more likely to suffer from a colour vision deficiency involving the red and/or green cones. This is because then inherit only one of them, and it is the only one which could possibly be expressed. What's more, the red and green cone genes are adjacent to each other on the chromosome, and mixing can occur during meiosis. On the flip side, women inherit two of each. There has been some research (last I heard, not yet conclusive) to suggest that in the case of some women both versions of the red and/or green cone pigment genes are expressed, endowing the individual with more than the normal three types response curves. 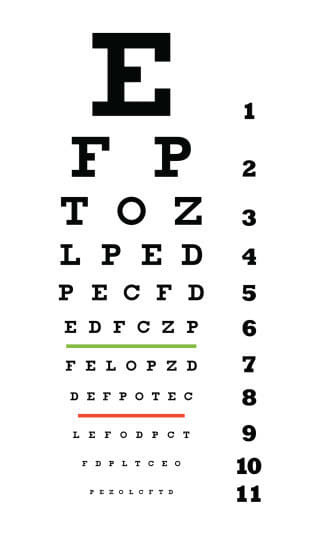 This has the potential to enhance colour vision if other aspects of the visual system can make use of the extra information. Studies into neuroplacticity suggest that it is at least possible, and an abundance of anecdotal evidence tends to support this conclusion. I can look at three paint swatches and be completely unable to tell them apart. All the same shade of beige. My wife can look at them and say "Nope. This is taupe, this is sage, and this is beige." And she's not making it up. There is >>much<< material to read on the subject of vision, human vision, colour vision, low-light vision, etc. Lots of it can be found through Wikipedia. Each monitor will be endowed with red, green, and blue sub-pixels, each with their own spectral emission curve. Those curves cannot be altered by calibration of the display. The interaction between the sub-pixel spectral curve and the viewer's retinal sensitivity curves will dictate how a given individual sees an image on a given monitor. I may have a (very mild) form of deuteranomaly, but I'm certainly not suffering from it :), On the other hand, I have always had the idea that my night vision was "above average", but never bothered to do any objective test. That shrimp may have lots of different rods, cones, cubes and spheres, but does it have the brainpower to process them? Just read the article and it sure is a weird little critter.